“Academia is very fertile ground for invention, but in order to have an impact on society, industry involvement is critical,” says Professor James Fujimoto, a principal investigator in the Research Laboratory of Electronics (RLE) and Department of Electrical Engineering and Computer Science at the Massachusetts Institute of Technology (MIT). 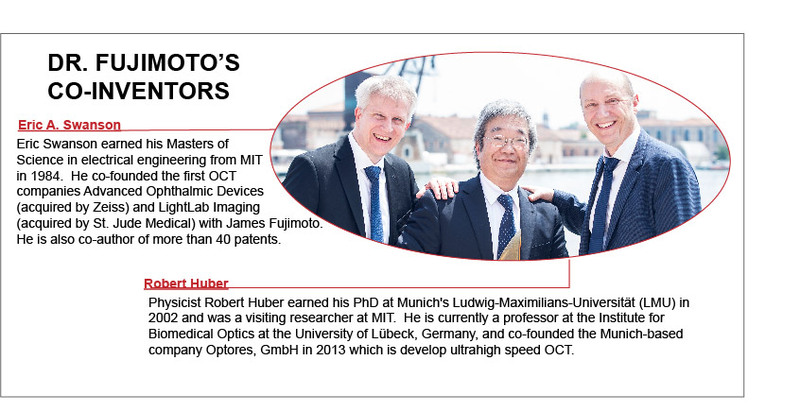 Dr. Fujimoto obtained his Ph.D. in Electrical Engineering from MIT before joining the MIT faculty in 1985. As Elihu Thomson Professor of Electrical Engineering, he is part of a team of inventors at MIT who—in conjunction with Harvard Medical School clinicians and MIT Lincoln Laboratory—developed optical coherence tomography (OCT), a new biomedical imaging technique for which he and his colleagues, Eric Swanson and Robert Huber (see box), recently won the European Patent Office’s (EPO’s) European Inventor Award. The three patents for which the team won (see box) are part of a larger portfolio of OCT imaging technologies that allow clinicians to see high resolution, cross-sectional, and three-dimensional images of pathology in real time. OCT has been most widely applied in ophthalmology, but is also being developed in other areas, such as cardiology, dermatology, and gastroenterology. OCT is an example of how academia and industry can employ their respective strengths to bring life-changing technologies to market, says Dr. Fujimoto. “In the academic research community, we publish extensively, we present at conferences, and this information is shared among a worldwide group of researchers, enabling rapid advances in knowledge. In industry, new information is often not publicly available. But in order to develop new technologies, validate them clinically, and impact healthcare, partnerships with academics, government, and industry are crucial,” he adds. Dr. Fujimoto describes for Innovator Insights what OCT is and how it was developed using this collaborative approach. OCT is the optical analog of ultrasound imaging. It performs what people call “optical biopsy,” by allowing physicians to see pathology in real time in situ without having to remove specimens as in excisional biopsy. When OCT was first introduced, it generated images that were unlike any others—cross-sectional and 3D imaging at resolutions that were previously not possible without removing tissue for microscopic examination. Now, it’s a standard of care in ophthalmology with an estimated 20 to 30 million procedures internationally per year. OCT can diagnose disease as well as guide treatment. One of the advantages of OCT in ophthalmology is it enables non-specialists to detect disease with sensitivities approaching that of a specialist. Detecting disease at earlier treatable stages, in a wider sector of the population can have a powerful impact on healthcare. What was the OCT development process like? We were performing research in “femtosecond optics” and we became interested in applying ultrafast physics techniques to the eye. We wanted to use light in a similar way to ultrasound, where you measure the echo time delay of sound. Imaging with echoes of light has higher resolution than ultrasound and doesn’t require contact with tissue. However light travels a million times faster than sound. Echo delays of light are so fast they cannot be measured directly by electronics; optical techniques such as those used in high speed optical communication are required. One of the key advances was made by an M.D., Ph.D. student in our group who first demonstrated that these echoes could be displayed as cross-sectional, false-color images. At the same time, we began collaboration with Eric Swanson at MIT Lincoln Laboratory, a U.S. Department of Defense research lab. Eric specialized in advanced communication technology—in particular, satellite communications and fiber optical networks. His expertise took OCT from a slow and bulky laboratory setup to a high speed and compact prototype instrument that could be used in the clinic. Working with clinical collaborators, we imaged over 5,000 ophthalmology patients, performing the first OCT studies of diseases such as diabetic retinopathy, glaucoma, and age-related macular degeneration. This was all done with a single prototype instrument and was a key step to developing clinical applications. We also began to develop a patent portfolio for the technology with the idea of creating a startup company. Academics enable rapid development of new ideas, but commercialization is essential to have a broad impact. We founded a startup company, which was later acquired by Zeiss. More recently, Robert Huber, a scientist from Germany who was working in our group, invented a new laser technology known as Fourier Domain Modelocking. This technology dramatically increased the imaging speed of OCT and played a key role in accelerating the development of intravascular OCT. Robert returned to Europe and co-founded a startup company, Optores, which is developing ultrahigh speed OCT. Ultrahigh speeds allow 3D OCT volumes to be acquired at video rates and promises to enable new applications such as investigation of transient processes, surgical guidance, and augmented reality. How important was patent protection to your success with OCT? When there is a new technology or method, the amount of investment for the company that first enters the market is immense, especially in medicine. Industry must engineer the technology and manufacture the product as well as support clinical studies, obtain regulatory approval, and develop the market. In this context, patent protection is extremely important because it protects the investment of the firms pioneering the technology. Of course, the patent system can also block entry to the market, but for new technology it is extremely important. Why do you think there’s so much criticism of patents, particularly within the academic community? I actually don’t think the patent criticism comes from the academic community. I think companies are concerned about their access to the market. Companies comment that their competitors’ expansive portfolios create roadblocks. I think academia is relatively supportive of patenting, especially in the U.S. with the Bayh-Dole Act, where patents facilitate the translation of academic research to industry. Ultimately, patenting is an important mechanism to protect the investment of an organization that is trying to bring something to market for the first time. Do you have advice for other inventors? There’s a lot of interest in startups these days, but entrepreneurship is quite hard. It requires experience. You only hear about the startups that are wildly successful or that are run by 18-year olds, but those are not at all typical. Many startups fail and all require an immense amount of hard work. Robert Huber said, “It’s easy to invent things; I can think of new ideas all day long. The hard thing is to do the background research, calculations, and experiments in order to see if they’re actually good ideas.” That’s a key concept—the inventive process is hard work. Practicing and developing skills is the most important thing you can do in professional training. However, if you’re really interested in technology, science, or engineering, then working on new technologies and ideas is not work at all—it’s interesting, fun, and artistic. Working with teams of people who have a positive impact on society, improve healthcare, create jobs, and develop the economy – what career path could be better?